I Just Boldly Went Infant Onesie - Moar Stuff - You don't need it but you know you want it. 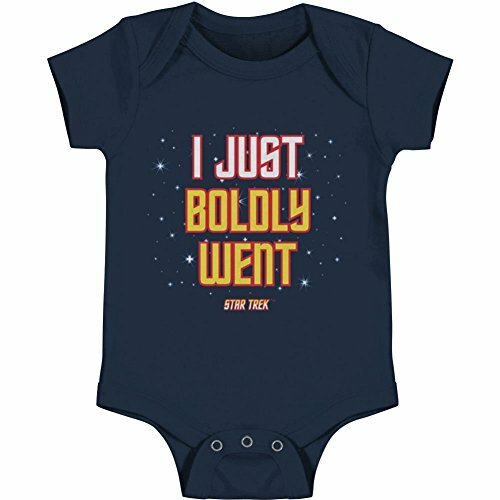 The “I Just Boldly Went” Infant Onesie is the perfect way to start your new baby’s Star Trek fandom. It’s also hilarious when you think about how many times the statement will be accurate. Well, unless you’re the designated Yeoman (changer). In that case, it won’t be so hilarious. It’s made from 100% cotton, comes in three different color options and different sizes up to 24 months. Be aware that some people have thought the sizes run a bit small. Maybe these were originally intended for Ferengi babies? This onesie perfect as a baby shower gift for a fellow Star Trek fan (or, maybe, someone you want to make into a Star Trek fan). Officially licensed Star Trek merchandise. 3 Colors available (Navy, Black, Gold). Several sizes available up to 24 months.